Many kids like to gussy up their looks with something creative (read: unusual) to help them feel special and be set apart from the crowd. Let’s face it, this is the only age they can get away with something like this. My own son is famous for this – finding unusual hats or resurrecting Halloween costumes to wear to school, and even creating masterpieces to alter his look dramatically. Sadly (and admittedly, not so sadly), he’s growing out of this. It was sometimes embarrassing to walk outside of the safety of our non-judgmental house with a boy who had fashioned a whole ninja costume out of paper and duct tape, though I appreciated his need to express himself. 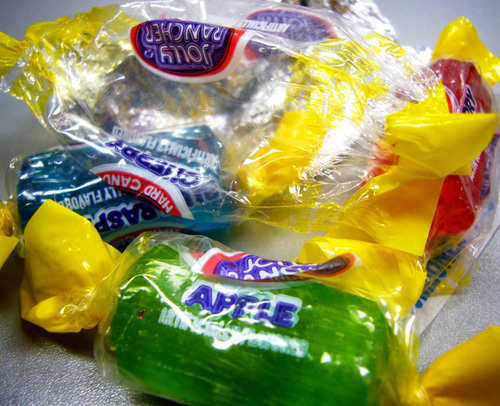 Little did Ukaila or Lucinda know that the Jolly Rancher hairdo would end up on Facebook where it would be ridiculed by all the teacher’s friends. The Facebook posting was noticed by one of the parents who is Facebook friends with the teacher. She promptly took screenshots of the Facebook posting and comments and sent them to the mom, who then furiously notified the school. The teacher immediately removed the photos and apologized. But it wasn’t enough. Lucinda felt that an apology was owed to 7 year old Ukailya directly. First of all, kids do strange things, and we adults should encourage their creativity as long as possible. So the fact that Lucinda let her child come to school with candy in her hair does not make her a bad person. Second, the photo should never have made it to Facebook as an avenue for teasing of a child that was not the teacher’s own. I’m sure it started out innocent enough, and meant in good humor. I mean, candy as barrettes is definitely a sight to be shared. But adults making fun of a little girl for her hair? That’s just mean spirited. And teachers especially need to be careful about what they post online about the children in their classroom, judging by all the many cases recently about teachers (here and here). So I agree, the Facebook posting was in poor taste and judgment. But here’s where I’ve parted ways with the semantics of this case. Why was Ukailya even made aware that her photo was on Facebook at all? She’d have been just fine never even knowing that the photo was online, or that people were making fun of her. And no matter what that teacher says to her in the form of an apology, this little girl will undoubtedly be left feeling totally self conscious about exerting creativity. I agree that the teacher started it. But I believe the mom contributed to it. And now Ukailya’s mom is getting a lawyer to prepare a lawsuit against the school and teacher for the Facebook posting, bringing further attention to a case of creativity being snuffed out. Think this child will ever try anything original again? Has your own child ever done something over the top creative that could be seen as unusual? HOW CAN ADULTS BE SO CRUEL!!! Her hair looks cute and very creative!! She is a child and children wear cute out of the box things all the time! Evil teacher should be fired!! What jerks. I think her hair is cute. I want to put candy in my hair. I know, right? I actually think this idea is incredibly original. And what kid doesn’t love candy anything? I bet the other students loved it. Why did this woman even become a teacher? Early childhood education teachers are supposed to encourage creativity and help them fell proud of their art. This little girl, for the rest of her life is going to feel so self conscious about thinking “outside of the box” and her future work will more than likely be “Just enough” to get her a passing grade & not reflect what she is really capable of…..because she wonders who’ll ridicule her next. I like the hair. I agree with the comments that the child was just being creative. I see nothing wrong with letting your child express themselves. I’m shocked the teacher was dumb enough to post this on her facebook. Not being conscious of the power of social media is not an excuse. She will be lucky not to get fired. 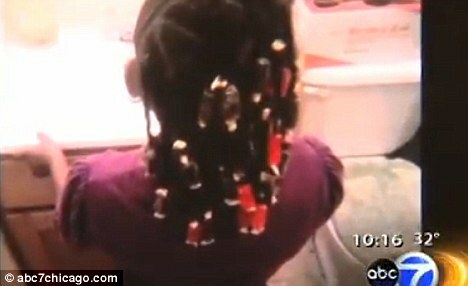 Some kid in Chicago has candy in her hair and so what? That’s it? I am a parent. I think this was the cutest think and wonderfully creative on the part of the Little One and her Mother. My problem is with the “Teacher”. She needs to be fired, not for being so stupid but for posting a picture of a child that IS NOT HERS without parental consent. Kids cant be photographed while on a school sponsored field trip and having the photo shared without parental consent. My question to the teacher is “how would you feel if some STUPID “adult” did this to your child? She shouldn’t be responsible for other peoples’ children. As a mother, my urge would be to whip her behind for exploiting my child. I agree. The teacher needs to be fired. Little girls should be able to do cute things with their hair. Have you seen some of the wacky looks from runway shows?! Shame on the teacher’s FB friends! I want to see their names next to the comments, so we can friend them and ridicule their hair!